It’s the heart of the project – our steering committee consisting of all project partner. 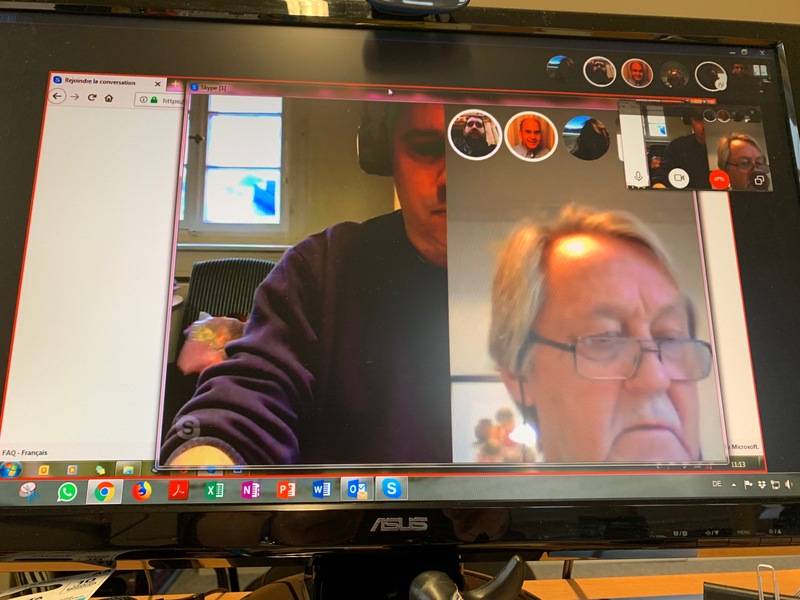 We think it is a good sign for an active project that the committee is regularly in contact, having Skype meetings, documenting everything in written minutes etc. By the turn of the year we will go to the final phase of the project. We still have two transnational meetings in 2019 and the writing of the manual has already started. That’s good progress. We are looking forward to the things that will come. We are ready and very confident that we will finish the project accroding to our aims. See u all in 2019. 7 small movies to get “moving” impressions form the transnational meeting in Sweden. Have a look! A public activity in Sweden for the promotion of our project on the 8th of May. We ”occupied” the hall of the municipal hall in the community of Ljusdal, up north in the county, to give information of our project and about our Europe House. We met around 75 intrested people during 2 hours. In the photos is Hasse and a representiv, Lena Husen, from ”All o Sweden shall live”. We had meetings and contact with people who will be engaged in the meeting in Sweden. Very productive. After the first international meeting in France the newly established citizens group in Bad Marienberg enhanced its activites. But instead of just setting up the agenda we realized “citizens interviews” to recheck if we are in line with what local citizens really want and care about. Thus each and everyone of us consulted friends, family, relatives, colleagues and so on to ask specific questions about the needs of local citizens in our rural area. With this results, that were developed in recent weeks we continue in August with our next local meeting where we will focus more on the content after having collected all the content beforehand. More in August when we will proceed with our local activities…. After the approval of the project in Germany and the first meeting of the steering group in Budapest during the EUNET annual conference, in the Netherlands we started our search for an additional partner. 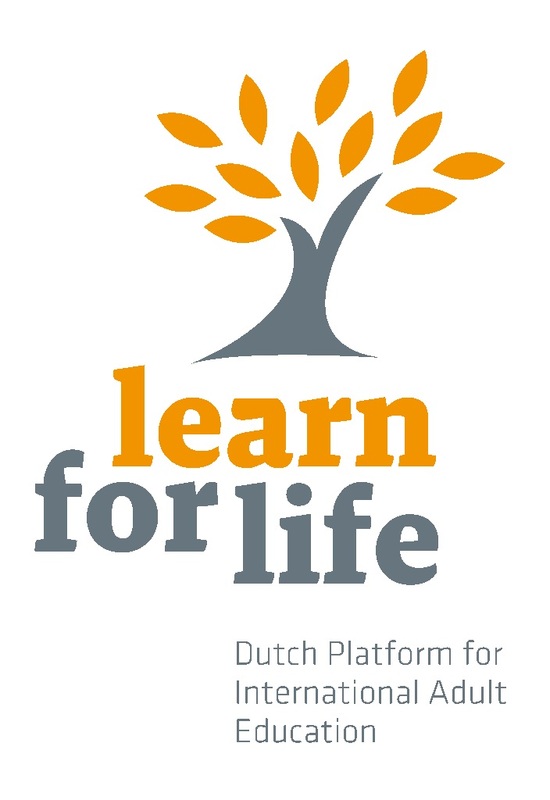 Through some contacts that we (from Learn for Life) consulted we came in contact with an organization called VKD (association of small villages). This is a very active umbrella organization for village councils in the Frisian municipality of Weststellingwerf. All 24 small villages are member of the VKD. They represent the villages where it concerns municipality wide developments. The VKD and the municipality inform each other about new developments. Together they think about ways to maintain and widen the involvement of the villages in municipality wide developments. 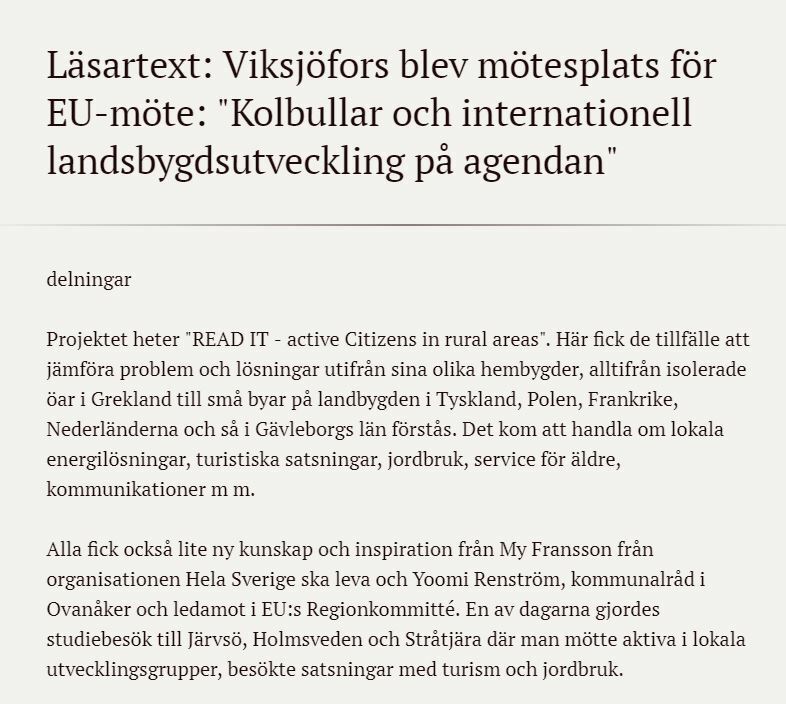 One of the board members of VDK is actually working for Doarpswurk and through the Read It project we see an extra opportunity for cooperation between LfL, VDK and Doarpswurk. In the past Learn for Life and Doarpswurk had a common strategy for development of the rural areas called the rural academy. Because of new workers, new targets and much other work, this academy has been dormant for a couple of years. But through the READ IT project new opportunities have risen for this cooperation. Doarpswurk (www.doarpswurk.frl) is a professional organization in the Dutch province of Fryslân. They support an stimulate initiatives that strengthen the livability in the rural area of the province. Doarpswurk always makes sure the responsibility and ownership remain in the village itself. They offer proactive, innovative and accessible support to the boards of community centers, village boards and other civil initiatives that strengthen togetherness in villages. Target points at the moment are Network of Sustainable Villages, Energyshop, new democracy and health in rural areas. 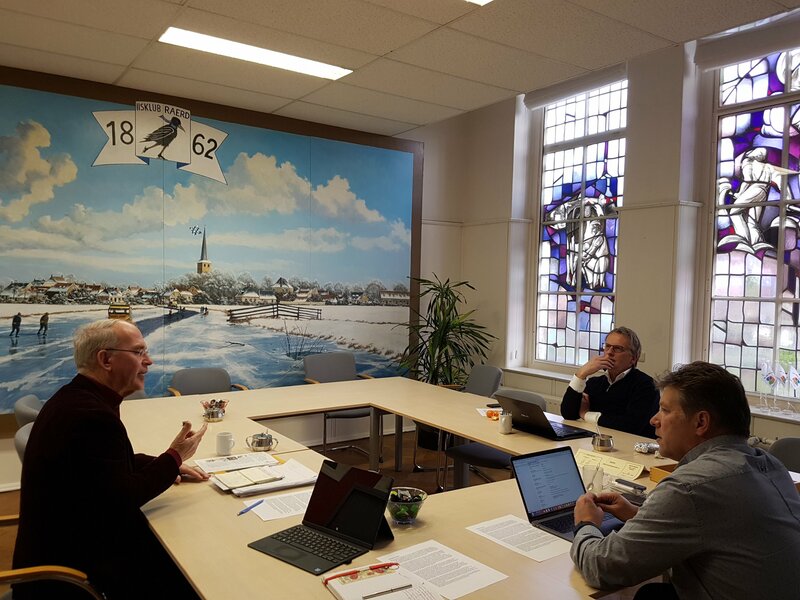 We had an initial meeting in the beginning of February with the director of Doarpswurk and the board member of the VKD who also works for Doarpswurk. We discussed about the workload, but mostly about the possibilities this project can provide for us all. The LVKK is the Dutch national organization for small communities. They are an umbrella organization for various provincial organizations like Doarpswurk. They fight on a national level for the rural areas of the Netherlands and the people that live there. We brought the READ IT project to their knowledge and they are very interested. The province of Fryslân is, according to Dutch standards, a very rural province. It is the only Dutch province that has had a separate policy for the rural area for over 30 years. They are very concerned with the livability and demographic changes there. The main aim of the policy is to maintain and strengthen the livability in the rural area. One of the main targets has always been the support for community centers when they want to build or remodel. The idea behind this is, that community centers are very important for the livability. This is an important partner in the dissemination of our manual. The Noordelijke Hogeschool Leeuwarden (NHL) is an institution for higher education. They have a lectorate for new welfare. This is much broader than health issues, it is all about working with and about livability, activating citizens and helping active citizens. They can add innovative methods for activating citizens and also play part in the dissemination of the manual.